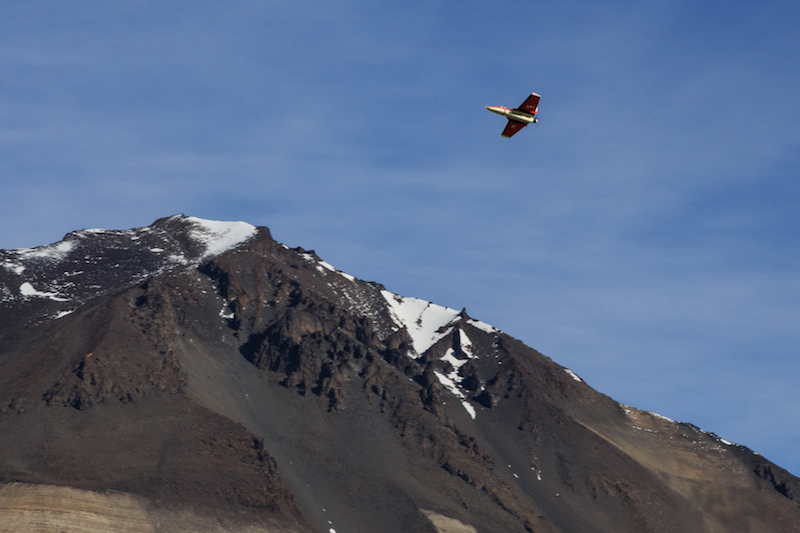 The reason I’ve made this trip to Antarctica is to use small unmanned aerial vehicles (UAVs) or drones to make weather observations (temperature, humidity, pressure, and wind). The drone I’m flying is called a Small Unmanned Meteorological Observer or SUMO. Marwan, the scientist from New Zealand that invited me to participate in this field project, is flying a larger twin propeller drone, but he is making similar measurements to those that I make with my SUMOs. 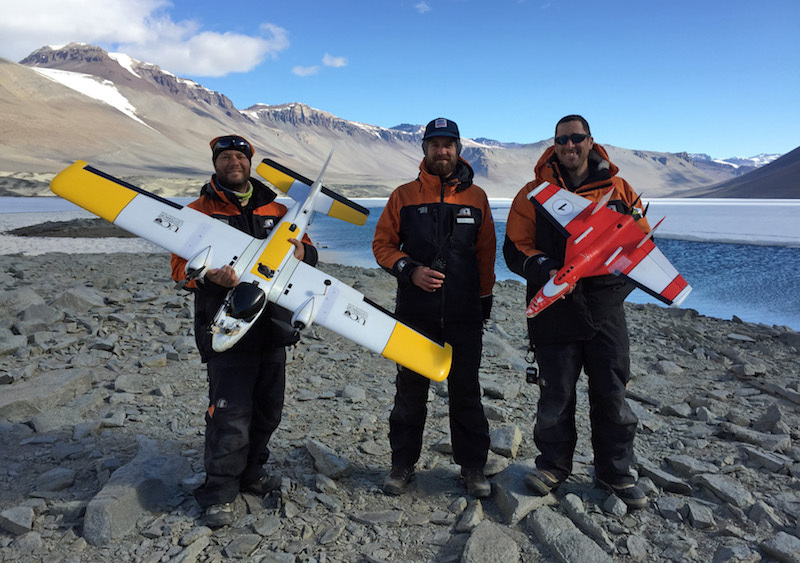 Marwan, Dion, and myself posing with our drones on the shore of Lake Vanda. Our research is focused on the lowest few thousand feet of the atmosphere called the boundary layer. The boundary layer is the portion of the atmosphere that interacts directly with the underlying surface and responds to changes in heating or cooling of the ground. 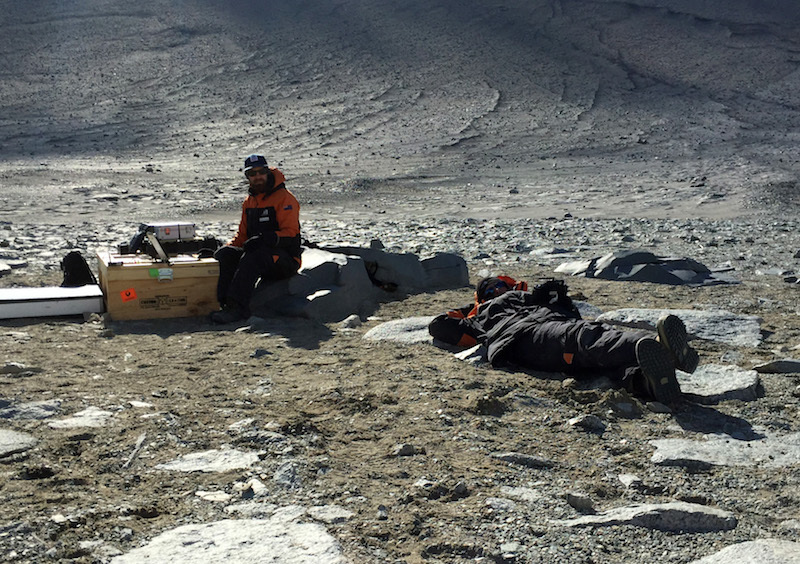 This heating or cooling of the boundary layer can generate thermally driven winds and the McMurdo Dry Valleys (MDVs) experience very strong thermally driven winds. The strong 20 to 30 mph winds we experience most afternoons here are driven in part by the heating of the boundary layer over the valley during the day. The work I’m doing on this trip is similar to the work I was doing in Antarctica last September and on several of my other recent Antarctic field campaigns. This trip is giving me an opportunity to extend the observations I made on my previous trips by making measurements at a different time of year (mid-summer instead of late winter) and in a different environment (an ice free valley surrounded by steep ridges instead of the flat Ross Ice Shelf). 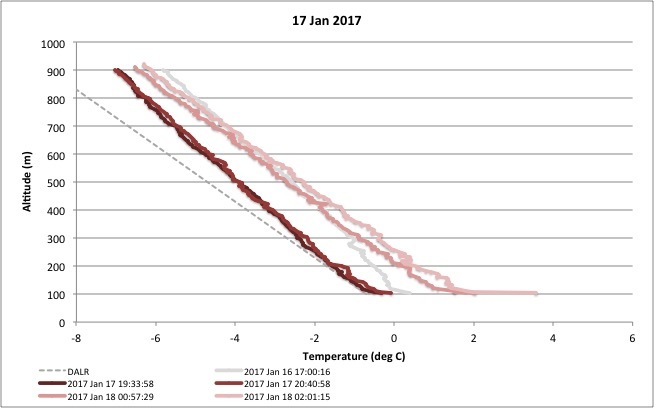 The plots below show temperature measurements I’ve made with the SUMO UAVs in September 2016 on the Ross Ice Shelf and just this past week in Wright Valley. These plots show how temperature changes as you move up through the lowest 1500 to 3000 feet (500 to 1000 m) of the atmosphere. The September observations show that it gets warmer as you move up through the atmosphere and this is what is typically expected in winter conditions when no sunlight is available to heat the ground. This increase of temperature with height in the atmosphere is called a temperature inversion and happens in most places at night, although in Antarctica the increase in temperature is much larger than in more temperate locations like Colorado. The observations I’ve made on this trip show the opposite situation, with temperature decreasing as you move up through the atmosphere. This decrease is due to the fact that the ground is being heated by the sun. The warm ground then heats the air, but with decreasing efficiency the further away from the ground you move resulting in air temperature decreasing with height. 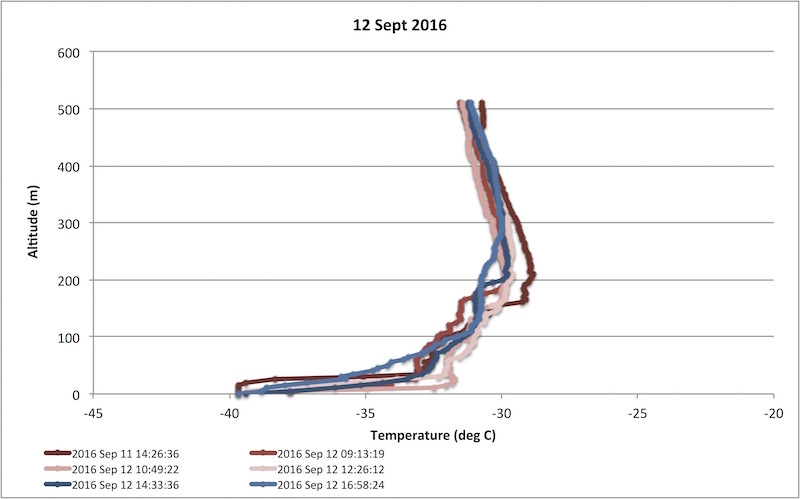 Temperature measurements from my September 2016 field campaign. These plots show very strong temperature inversions (lines moving up and to the right on the graph) with temperatures increasing over 10 degrees C (almost 20 degrees F) over the lowest 200 m (600 feet) of the atmosphere. Temperature measurements from my current field campaign. These plots show temperature decreasing about 1 degree C (1.8 degrees F) for each 100 m (300 foot) increase in elevation (lines moving up and to the left on the graph). By making these types of measurements at different times of the year and in different physical settings we are able to develop a more complete picture of how the Antarctic atmosphere behaves. This data also gives us a broader dataset with which we can evaluate weather and climate models. I’ll be extending this dataset again in April to June of this year when I’ll be on a two month research cruise in the ocean just north of Antarctica. 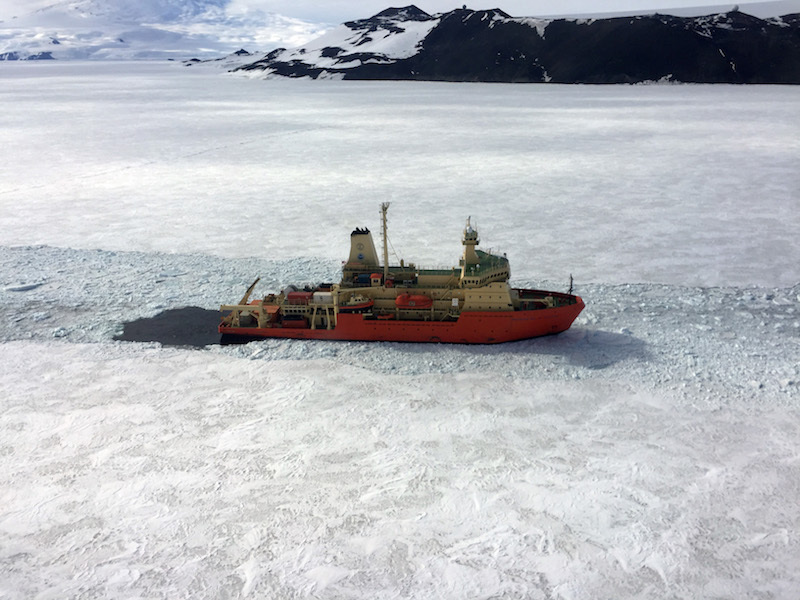 The Nathaniel B. Palmer icebreaker in McMurdo Sound. This is the ship I’ll be working from in April of this year. I flew over it on my way back to Scott Base from the Lake Vanda field camp. The conditions I experience while making measurements with our drones at different times of the year and in different locations are of course very different. For my September trip I experienced both daylight and darkness and very cold temperatures (as low as -56 degrees F). 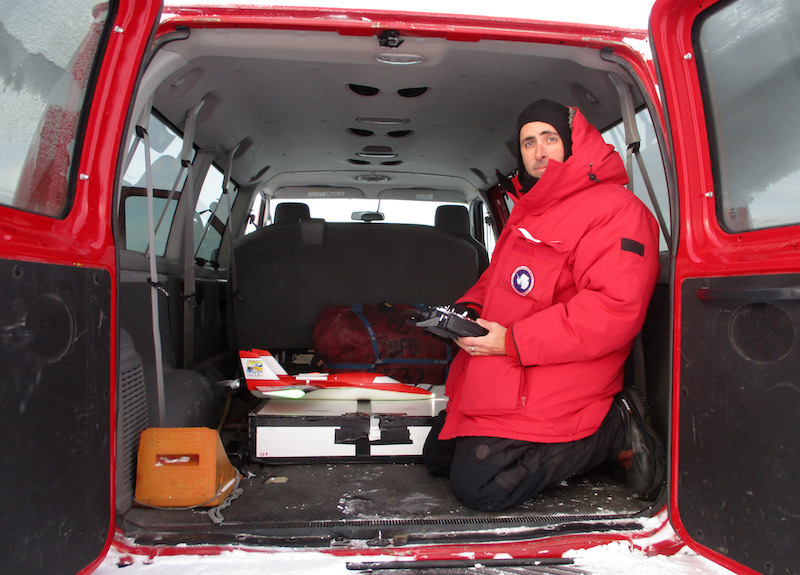 To stay out of the cold as much as possible we used a van as our mobile pre-flight facility and would only go outside to launch and land the SUMO. Here I am preparing a SUMO for flight in September 2016. The temperature at the time this picture was taken was -45 degrees F.
A SUMO UAV circling over the Pegasus ice runway at night during my last Antarctic trip in September 2016. 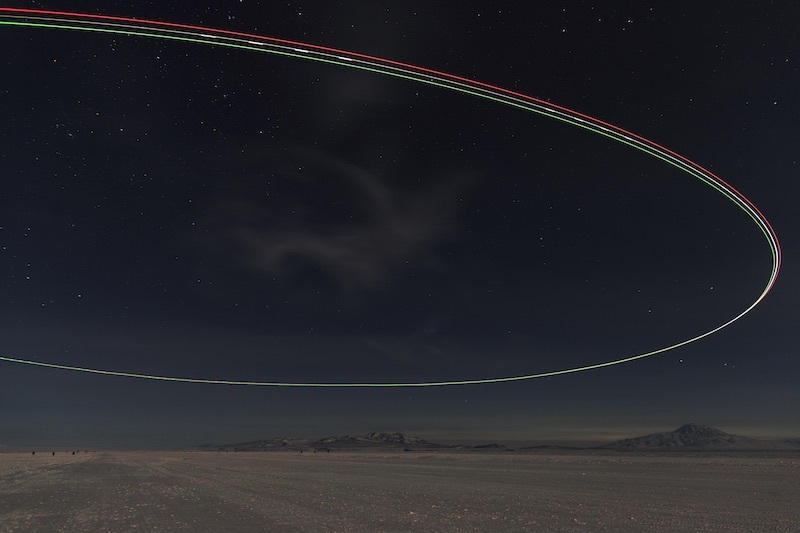 In this time lapse photograph the lights on the SUMO trace the circular flight path of the SUMO. The green line is from a light on the right wing tip, the red line is from a light on the left wing tip, the solid white line is from a light on the nose of the plane, and the dashed white line is from a flashing light on the tail of the plane. For my current trip the sun is up all day and I haven’t seen a dark sky since I left New Zealand almost two weeks ago. The temperatures are also much more mild with temperatures in the 30s F. This allows us to spend extended periods of time outside doing our SUMO flights. Two days ago we were out for 8 hours doing flights between midnight and 8AM. SUMO flying over the Wright Valley. We’ve gotten into a very regular routine for doing the SUMO flights. For each flight we spend several minutes getting the SUMO ready. This involves checking the plane for any damage, inserting a battery, setting up the ground control software on a laptop computer, and testing the motor and flight control surfaces on the plane. Once the plane has been prepped it is launched by throwing it into the air. Marwan has been handling this part of the launch while I control the plane manually with a remote control. Once the plane is flying I switch it to autopilot mode at which point the plane begins flying the pre-programmed flight plan. During this phase of the flight one person (Dion on this trip) monitors the plane on the ground control software while I watch the plane fly overhead, always at the ready to take manual control of the SUMO if any problems occur. Once the SUMO has completed the pre-programmed flight mission, which usually takes 20 or 30 minutes, I land the plane manually using the remote control. I’ll be posting videos of a SUMO launch and landing in my last blog post from this trip, once I’m back in New Zealand and have a fast enough internet connection to upload the videos. Dion and I conducting one of our SUMO flights in the Wright Valley. Dion is monitoring the SUMO on a laptop computer that tracks the plane’s position while I’m lying on the ground to watch the plane circling almost 3000 feet directly overhead. I’m holding a remote control that I can use to take control of the plane at any time during the flight if a problem occurs with the pre-programmed flight plan. 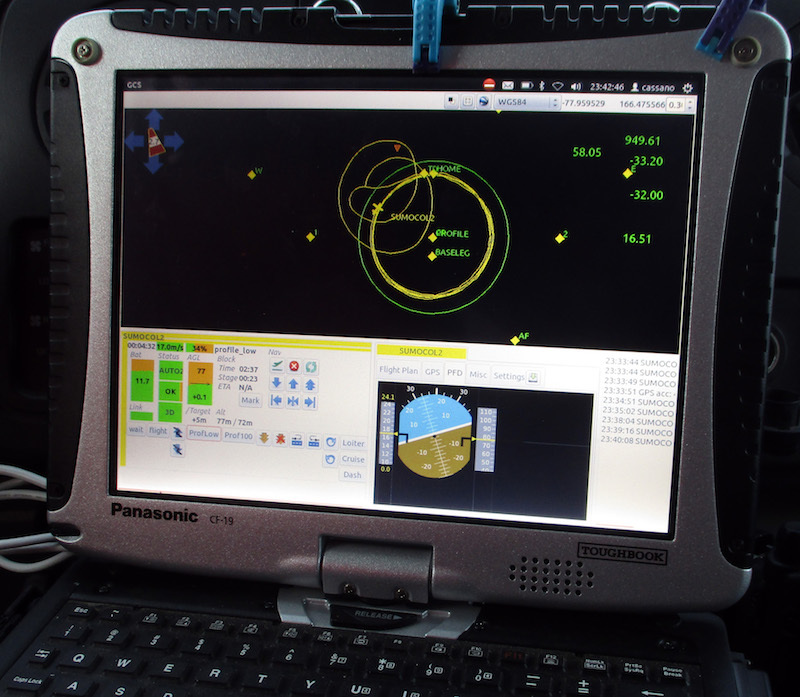 Here is what Dion sees on the ground control software on the laptop computer. The top portion of the screen shows a map with a yellow line showing the track of the SUMO over the past few minutes. The numbers on the top right side of the screen show the pressure (949.6 mb), the relative humidity (58%), the temperature (-33 deg C), and the aircraft ground speed (16.5 m/s). The bottom half of the screen includes additional information about the aircraft (like battery voltage and information on the GPS and communications status), provides buttons to switch to different autopilot options, and an artificial horizon to show the plane’s attitude. Note, that this image is from our September 2016 flights. Yesterday was the last day we flew our UAVs on this field campaign. We had a very successful trip, completing over 20 flights under a wide range of weather conditions, with no aircraft problems or injuries. I flew back to Scott Base in a helicopter flight today (Thursday January 19th) and should be flying back to New Zealand early next week. I’ll post my last blog post from this trip once I get to New Zealand. 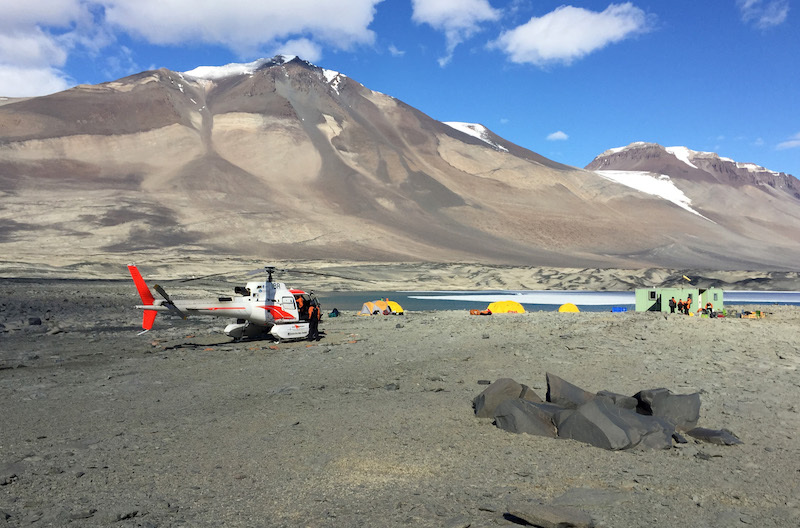 Helicopter at Lake Vanda camp just before I left for Scott Base. 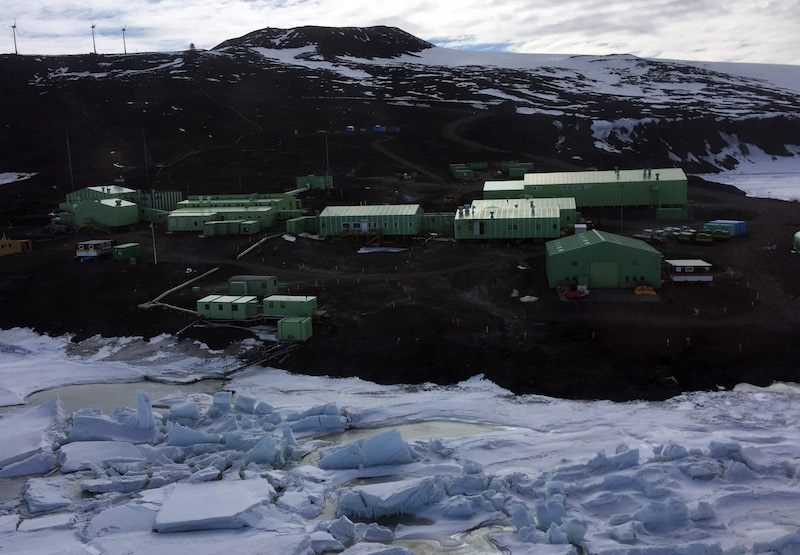 Scott Base viewed from the helicopter as I returned from the field camp.